† It is speculated that the unknown symbol is really the letter P, however this is not confirmed. 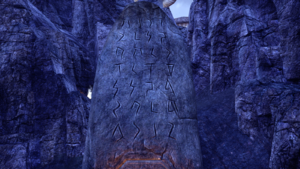 An Ayleid inscription which reads "Av latta magicka, av molag anyammis", which translates to: "From light, magic; from fire, life". or "Av latta magicka, av molag anyammis", which translates to: "From light, magic; from fire, life". This is a reversal (perhaps unintentional) of the phrase translated in the book: Ayleid Reference Text: "From fire, life; from light, magic." The double 'm' in "anyammis" has been truncated to a single 'm', and the 's' is too obscured to see on this inscription, but otherwise, it is clearly the same text. 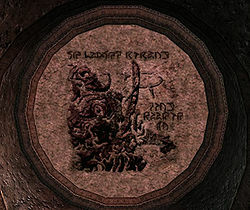 A Dwemer pipe which reads "Wormgod" in Dwemer runes. 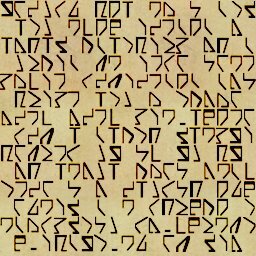 A Dwemer door which reads "In loving memory, Gary Noonan, Sr." in Dwemer runes. Which translates to: "In loving memory, Gary Noonan, Sr."
A Dwemer banner from Redguard. The significance of these remains unknown at this time. Since each group of characters is in consecutive alphabetical order, it seems likely that it's simply an alphabet. Aleyid writing in the Chapel of Dibella. Another example can be found in the official Knights of the Nine Official Plug-in. At the beginning of the quest Pilgrimage the player finds an Ayleid text written on the floor of the Anvil chapel. This text reads which translates to As oiobala Umarile, Ehlnada racuvar. According to the prophet this means: By the eternal power of Umaril, the mortal gods shall be cast down. 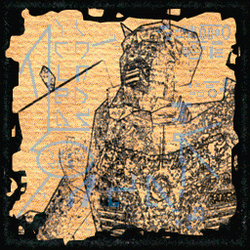 This text can also be found on the side of the Knights of the Nine box. An Elven inscription found in Honor's Rest. 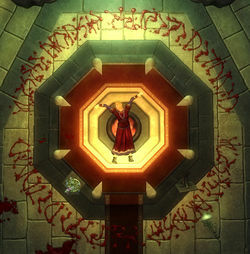 An inscription is found on several altars in Honor's Rest. If mirrored it is clear that it reads: , or "DIVINE STARS". The same inscription can also be found on the Gray Menhir in Upper Craglorn. 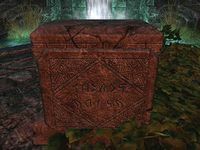 In ESO several Elven letters are carved into Khajiiti shrines found in Sathram Plantation and Do'Krin Monastery. 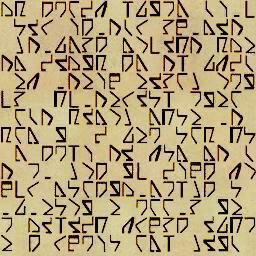 It reads , which when transcribed becomes "MKAC OLBD NMIE CICY BBDV TGIU VEAO". This has no apparent meaning. 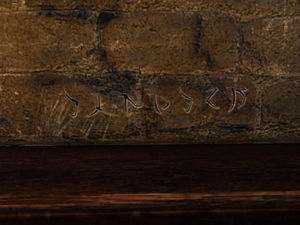 Dwemeri inscriptions are found in the Seht's Balcony stage of the Maelstrom Arena. The first inscription, which is written in a semicircle and then mirrored, reads . It becomes "XM PGT OHC MSJ UFW YWQ AV XPT" when transliterated. The second inscription, which is written to the sides of the first, reads . This in turn becomes "VA DGP MX VA DQW XF" upon transliteration. 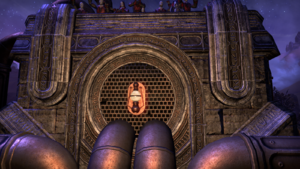 An Altmer inscription can be seen on a wall of Tarnamir's manor during the quest Old Wounds in ESO. It reads "ELUVEIN", which is a name of a species of owl that abandons its eggs after laying them, and is also used to by the Altmer to describe cold-hearted people. Analysis of the books is inconclusive at this time. According to Douglas Goodall, one of the game's developers, they are just random characters. Additionally, certain passages are repeated verbatim, but in a different order, from one book to the next, or even on both pages of the same book. This smacks of copy/pasting by the artist who created the graphics for the pages. Also, substituting the known letters for their English counterparts does not reveal even a hint of readable text. If it's a cypher, it's not a simple one, because several different characters can be seen as single-letter words, whereas in a typical English-language cypher, you would only see two - 'A' and 'I'. 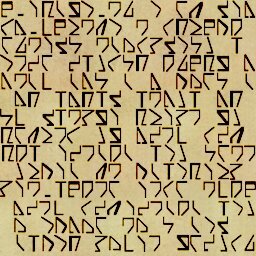 A more complex cypher is still a possibility, but without knowing the key, or even the meanings of half of the letters, it would be quite a difficult task to decode it, assuming there is anything to decode. 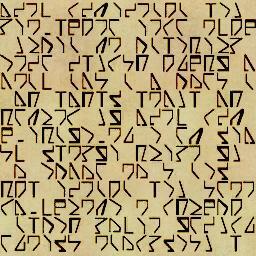 "Egg of Time and Divine Metaphysics are, as far as I know, random Dwemer letters. The letters don't have any real pattern or meaning. Dwemer books probably appear meaningless to anyone but a Dwemer anyway. I have some ideas on how Dwemer books might be misinterpreted by modern scholars, but it has little to do with the actual contents of the book." This page was last modified on 25 October 2018, at 21:47.